The first in-depth investigation of the role money plays in the world’s largest democracy. 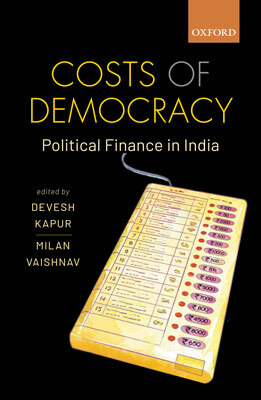 In this original, in-depth investigation—drawing from extensive fieldwork on political campaigns, pioneering surveys, and innovative data analysis—the contributors in this volume uncover the institutional and regulatory contexts governing the torrent of money in politics; the sources of political finance; the reasons for such large spending; and how money flows, influences, and interacts with different tiers of government. In the process, the book raises uncomfortable questions about whether the flood of money risks washing away electoral democracy itself. Devesh Kapur is Director of Asia Programs and the Starr Foundation Professor of South Asia Studies at the Paul Nitze School of Advanced International Studies (SAIS) of the Johns Hopkins University in Washington, DC. Milan Vaishnav is senior fellow and director of the South Asia Program at the Carnegie Endowment for International Peace in Washington, DC. Across the world, democracies are showing signs of stress. One of the many factors underlying this “democratic malaise” is the inability of representative governments to manage the deluge of money in politics. To date, the vast majority of the literature on political finance has focused on the developed world. Yet, the flow of money is likely to operate very differently in developing democracies, and with distinctive consequences. This chapter serves as an introduction to this edited volume, which seeks to shed light on the methods, sources, and implications of political finance in a major developing country setting—India. Drawing on a range of methodological approaches, the findings contained in this book suggest a range of theoretical and empirical implications for the comparative social science literature on money in politics. This chapter surveys the legal and regulatory history of political finance in India, situating it in the context of India’s political economy. It devotes special attention to recent developments, including new reforms implemented by the Modi government in 2017. It also discusses possible areas of reform, including the regulation of political parties, which can lead to increased transparency and help the country break out of a corrupt equilibrium. This chapter investigates the role of personal wealth and self-financing candidates in Indian elections, namely why financial capacity of the candidate is an important feature of Indian electoral politics and how it structures the incentives of political parties. Using detailed data on candidates’ assets, this chapter demonstrates that a candidate’s personal wealth, measured in terms of moveable assets, has a significant positive impact on her electoral fortunes. It further shows that wealthy candidates directly filter into competitive parties. But even among these wealthy candidates from competitive parties, the wealthiest candidate has a greater probability of winning the constituency. The empirical results strongly support the view that there are structural and institutional reasons for the outward display of wealth in Indian electoral campaigns. In many developing countries, politicians often turn to private firms for illicit election finance. In sectors where firms are highly regulated, politicians can exchange policy discretion or regulatory favors for financial support during elections. This chapter explores this dynamic by focusing on the role of the construction sector in India, a domain where regulatory intensity is high. Specifically, the chapter posits that builders will experience a short-term liquidity crunch as elections approach because of their need to re-route funds to campaigns as a form of indirect election finance. The chapter uses variation in the demand for cement, the indispensable ingredient for construction, to investigate the presence of an electoral cycle in building activity consistent with this logic. Using a novel monthly-level dataset, the chapter demonstrates that cement consumption does exhibit a political business cycle supportive of our hypothesis. In recent decades, India has witnessed an upsurge in electoral participation among lower caste voters. This broadening social profile of democratic practice occurred alongside a pluralization of the party system marked by the entry of new contenders advocating on behalf of lower caste groups. Coincident with this transformation of the political arena, the country recorded an alarming growth in gross electoral expenditure. Today, reliable estimates peg India as the world’s second most expensive democracy in terms of aggregate campaign spending. This chapter examines how the most prominent Dalit (ex-Untouchable) party in Tamil Nadu—Viduthalai Chiruthaigal Katchi (VCK) or Liberation Panthers Party—navigates the challenges associated with election finance, investigating how VCK candidates mobilize resources to sustain competitive campaigns. Fiscal constraints incentivize smaller parties to join coalitions spearheaded by their more established counterparts, yet these electoral arrangements do not strictly entail a quid pro quo exchange of vote-banks for financial and canvassing support, but entail complex negotiations that structure the terms of electoral participation. While “vote buying” theories tend to treat parties to cash exchanges as either transaction agents or as information-gap bridges, this paper seeks to show that people involved with moving money are key actors in broader political economies, and that the networks through which cash flows are the very same ones through which the resources of off-season social and economic life is produced, assembled, and transformed. This chapter draws from ethnographic research in two very different sites in contemporary India – the first from the city of Mumbai and the secondly from rural Bihar. Examining the origins and distribution of exchanged money in these two sites unsettles received wisdom concerning the directional flow of monetary exchange, demonstrates that money originates not just from parties but rather from a wide variety of sources and that the money that changes hands at election time produces and articulates sociopolitical networks that infuse everyday life far beyond election day. This chapter focuses on what candidates concretely spend their money during presumably expensive campaigns. Specifically, it is interested in two questions. First, to what extent is this expenditure illegal – that is, unaccounted for officially? Second, and more importantly, to what extent is this illegal and unaccounted spending directed towards illegitimate tactics or tactics that potentially threaten the fairness of elections? Estimates from two recent campaigns suggest that gifts are neither the only nor the main reason why electoral campaigns are expensive in Mumbai. Other kinds of expenses, such as the short-term wages that candidates pay to their workers and to the crowds these workers in turn recruit, or even simply “politics as usual” expenses, place equally important constraints on candidates. This suggests that the perceived increase in the cost of campaigns does not have one cause but several, and that the narrative assigning the rise in the cost of campaigns to increasingly illegitimate tactics may be simplistic, or simply erroneous. Those who affect the outcomes of elections—via financial or means—often have greater access to elected officials. Yet, we frequently have little information about the dynamics of elections, let alone the relationship between campaigns and subsequent sway over officials. This chapter draws on surveys of politicians to illuminate three key aspects of campaign dynamics in India: differences in campaign costs across levels of government; variations in funding sources across levels; and the role of various actors in providing other forms of campaign assistance. The chapter finds, first, that financial support from political parties is relevant only at high levels of elected office, whereas personal resources dominate at lower levels. Second, a substantial portion of all respondents highlights the role of illicit funds in campaigns. Finally, sources of non-financial assistance—e.g. for voter mobilization—differ across levels of government. This concluding chapter ties together the book’s major themes and offers a roadmap for future policy and research. First, it presents key stylized facts that summarize the current realities of India’s political finance regulatory ecosystem. Second, it reviews an important recent development on the policy front: India’s sudden and dramatic decision to “demonetize” the rupee. Third, it discusses the motivations for pushing for deeper changes and outline the central tenets of a “grand bargain” for electoral reform that combines both carrots and sticks in order curb some of the most distortionary impacts that money is having. Fourth, it briefly assesses the question of whether the upstart Aam Aadmi Party (AAP) represents a new model of politics that combines internal party democracy with greater transparency in electoral funding, as some analysts have argued. Fifth, it concludes with some thoughts on a future research agenda. —Pippa Norris, Paul F. McGuire Lecturer in Comparative Politics at the John F. Kennedy School of Government, Harvard University, Laureate Professor of Government and International Relations at the University of Sydney, and founding Director of the Electoral Integrity Project. Billed as a victory for transparency in political funding, electoral bonds are guaranteed to garner positive headlines. Upon closer inspection, however, the bonds appear to legitimize opacity in political finance rather than combat it. In India, the state’s strong involvement in the economy, together with costly elections, has incentivized shadowy links between business, the criminal underworld, and politicians, exacerbating corrupt practices. Unless a farsighted Central government can champion campaign finance reforms, the after-effects of the ill-fated 1969 ban on company donations are likely to be felt long after its 45th anniversary. India’s struggles with cronyism and land deals are not new, but they will be hard to fix, since the glue that connects builders and politicians is election finance.